Lucky the cat has so far predicted 23 correct match results at the 2016 Copa America, with just six incorrect predictions. Allstate has brought back Lucky, the black cat who correctly predicted the 2014 World Cup Brazil outcome, to do the same thing at this year’s Copa America international men’s soccer tournament. Lucky is the sidekick of Allstate’s Hispanic advertising character Mala Suerte. Played by Spanish actor Alberto Mateo, Mala Suerte’s presence creates a series of misfortunes that are meant to remind consumers of what can go wrong and the protection Allstate can provide when they do occur. The campaign uses the insight in the soccer community that fans put their faith in rituals and superstitions, even looking to animals to help predict the outcome of a match. The Mala Suerte campaign, originally introduced in 2010, is an extension of Allstate's Mayhem campaign. The 2016 Copa America is being hosted in the U.S., marking the first time in its 100 year history that the tournament has taken place outside of South America. The campaign team began planning and conceptualizing ideas for its Copa America efforts back in January. Although Allstate is not an official sponsor of the Copa America tournament, the company looked for a way to be part of the conversation surrounding it and tap into fan passion. 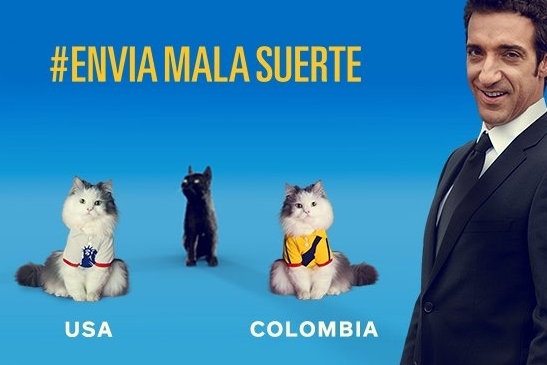 The PR team sought to create a campaign that would leverage Mala Suerte and chose to tap his black cat Lucky to predict match outcomes for the tournament. The brand decided to drive public awareness of the campaign through traditional and social media outreach. "As a sponsor of the Mexican national team, Allstate was looking to leverage the partnership into incremental brand equity with its target consumers," said Dan Keats, director of sponsorship marketing and integrated marketing communications for Allstate. "Allstate created this campaign with the goal of standing out and differentiating itself from a cluttered sponsorship landscape and did so by owning and driving conversation in the digital and social media spaces." The campaign was launched using an interactive consumer activation to drive initial traffic and bolster awareness of the campaign among the soccer community. The campaign was announced as part of an immersive fan experience during the friendly match between Mexico and Chile’s national teams on June 1, prior to the Copa tournament kicking off, where Allstate was the presenting sponsor. As part of its sponsorship of the friendly match, branded mobile vehicles, in-stadium giveaways, and flyers were all used to raise awareness about the digital campaign and drive consumers to social media. Fans at the event were also given a "Lucky ticket treat" to serve as a raffle entry and vote for the team they wanted to lose during the match via an oversized Lucky scale. At halftime, Mala Suerte took to the field to announce Lucky as the oracle for the upcoming Copa cup, using the jumbotron to show a pre-recorded video. Then, Lucky "took over" the jumbotron camera controls to pan the crowd and select his pick for the match landing on some unlucky Chile fans. Allstate also wanted someone with soccer expertise to speak about Lucky’s picks and help position the brand as an expert in the soccer community. Using Mexican national team legend Claudio Suarez, Allstate kicked off the campaign with an in-studio media tour in Los Angeles where the first matches were being played. Joined by Mala Suerte and Lucky, Suarez spoke with Hispanic news outlets about the campaign, while the cat made predictions about upcoming games during the live interviews. The campaign has a strong social media focus, with the goal of directing people to the Soy La Mala Suerte pages on Facebook and Twitter. The branded hashtag #EnviaMalaSuerte was created to support the campaign. Fans have the option of trying to sway Lucky’s choice by using the campaign hashtag to send bad luck to the opposing team. The hashtag component has helped to generate strong social engagement from soccer fans throughout the tournament. Creative and video content is being produced to support the campaign on social media. The brand has been posting updates on Mala Suerte’s Facebook and Twitter about Lucky’s picks and the different outcomes. "The campaign lives in real-time, as fan engagement with the #EnviaMalaSuerte hashtag influences the selections Lucky makes and thus the videos are published," said Keats. "Because of the real-time nature of fans voting, the [campaign] team had to be prepared and ultimately had to make creative for both outcome scenarios of each match." The campaign will wrap at the tournament finals on June 26 with an integration with ESPN Deportes’ Futbol Picante. Lucky will again join Mala Suerte for a live in-studio interview to pick the final losing team of the Copa America tournament. The Allstate Copa America program launch alone generated more than 58 million media impressions, across both social and traditional outlets. Following the group stages of play, the hashtag #EnviaMalaSuerte has generated 3.6 million estimated impressions from 954 Twitter mentions by more than 500 users. So far, the campaign has generated more than 19 million social media impressions. Claudio Suarez, Mala Suerte, and Lucky were featured on outlets including Univision TV programs A Primera Hora, Lanzate, and El Gordo y El Flaca; Univision Radio shows Zafarrancho and Uforia Nation; Zona Deportiva, FutbolTotal.com, GurusDeportivos.com, El Clasificado, Radio Caracol, and La Gran D Radio. Lucky has currently predicted 23 correct match results at the 2016 Copa America, with just six incorrect predictions.